Stainless steel toilet partitions are virtually indestructible and retain their gleaming beauty indefinitely. These units combine the strength of #304 stainless steel with a #4 satin finish or textured finish, formed and bonded to a honeycomb core. The face sheets are held rigid and permanently in place by an interlocking strip welded at each corner. Stainless steel components are impervious to just about any substance. Even scratches caused by deliberate vandalism can be removed by buffing. Stainless Steel bathroom stalls beauty of easily compliments any contemporary bathroom interior. Stainless toilet partitions are corrosion resistant, easy to maintain, and also allow for scratches to simply be buffed away. Partitions can be purchased in either satin or textured finishes. Gleaming beauty indefinitely. The elegance of stainless steel complements any design scheme. Incorporates the known corrosion resistant benefits of type 304 stainless steel and easily maintained. 5 Year Manufacturer’s Warranty. Stainless Steel bathroom partitions is a premium line of partitions manufactured from type 304 stainless steel with a #4 directional polish. Stainless Steel is rust proof, corrosion resistant and ideal for wet areas or rooms with a high degree of humidity. Its striking appearance enhances the decor of any restroom or dressing area. Its neutrality works with any color scheme. Stainless Steel partitions are fabricated and shipped with a PVC coating to protect its surfaces from scratches and abrasions. 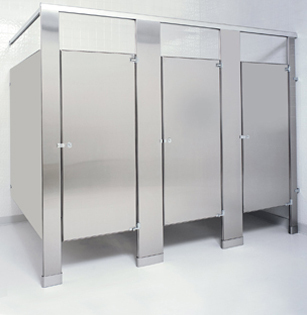 Stainless steel bathroom stalls lends a feeling of luxury and a modern appearance to any washroom environment. Stainless steel proves to be a wise selection for its ease of cleaning, durability, and resistance to humid conditions. Optional solid plywood core provides for an extra strong virtually vandal proof installation. Standard construction features 1″ thick doors and panels, (1-1/4″ pilasters), constructed of stainless steel, formed and cemented under pressure to a double faced paper constructed honeycomb core. All edges are finished with a 20-guage stainless steel interlocking molding. Corners are welded internally and are finished with pre-formed stainless steel reinforcements. Doors have internal steel reinforcements to secure hardware items, and come equipped with the “in-use” color-coded indicator. Wall fittings are chrome plated zamac die-castings. All flat stainless surfaces are provided with a #4 satin finish. Hardware features emergency outside access to stall.